I hope your week is going well and that you are finding some time for your creative pursuits!! Below you will find this week's card! Such fun we had on Monday! Our Rose Garden Thinlit card (Thank you, Trudy Pope, for the initial idea. 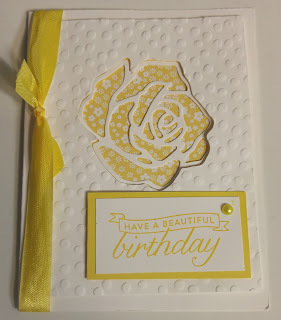 Trudy credits Dena Rekow for her idea, an elegant white card with Everyday Chic DSP below the rose cutout.) This is why I love CASE'ing ideas and that most stampers are all about sharing ideas. 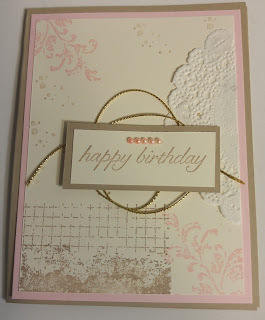 The card usually evolves into something quite different, as did my Daffodil Delight and Whisper White card! Keep scrolling to find Class Schedules and RSVP times! I wish I could credit the beautiful Timeless Texture card. My inspiration came from a swap that did not include the wonderful artist's name. I'll love sharing it with you!! HERE for the Retiring List. Email Ree at reenathan@bellsouth.net to RSVP or if you have questions! Please RSVP by the Saturday prior to the class. May 5 (Thursday) at the TAL building. May 25 (Wednesday) at the Titusville Public Library. 10:30-12:30 am for both classes. Please RSVP by the Sunday prior to the class. Please RSVP by the Sunday prior to the class. 6:30-9:30 pm--Alice is our host. Have a wonderful week and let me know if I can be of creative help to you! !